iPhone is a smartphone that is best known for data security and privacy protection. Apple designed this device so that information and data stored on an iPhone cannot be hacked by anybody or accessed without the prior permission of the device owner. Hence, the only way to bypass an iPhone screen lock is to gain or possess the passcode. However, Apple’s iPhone security features are near perfect but they also come with some flaws. Forgetting 4-digits and 6-digits iPhone passcode is a common among iPhone users. Sometimes when you’re caught up in this mess, you may be confused on what to do so as to recover access to your iPhone. Therefore, in this post, we shall be discussing how to bypass iPhone passcode without restoring iOS data. Is it Possible to Bypass iPad/iPhone Passcode without Restoring? On many occasions, we’ve received messages and inquiries from iPhone users who forgot their passcode. Some of these iPhone users would want to know if there is a way to fix a disabled or locked iPhone without restoring iOS data. Unfortunately, there is NO way to bypass iPhone passcode without restore. Even if you’re utilizing iTunes or iCloud to remove your iPhone lock, it will erase your device at the end. Therefore, one of the best ways to avoid losing your information, files and data is by backing up your iPhone to iTunes/PC or iCloud. Proceed by turning on the feature of iCloud backup by going to “Setting > iCloud > Backup” and turning on the feature of “iCloud Backup”. The best way to bypass iPhone passcode or lock screen is by taking advantage of a third-party tool for unlocking locked or disabled iPhone. iMyFone LockWiper is the best iPhone unlocking tool for unlocking or bypassing all kinds of iPhone lock be it 4-digits, 6-digits, Face ID, or Touch ID locked iPhone. Many of our software users have testified to the efficacy of LockWiper in removing iPhone locks just in few minutes. Therefore, if you’re not a fan of iTunes because of its complicated nature, you can choose an easy to use the tool – iMyFone LockWiper in bypassing iPhone passcode. 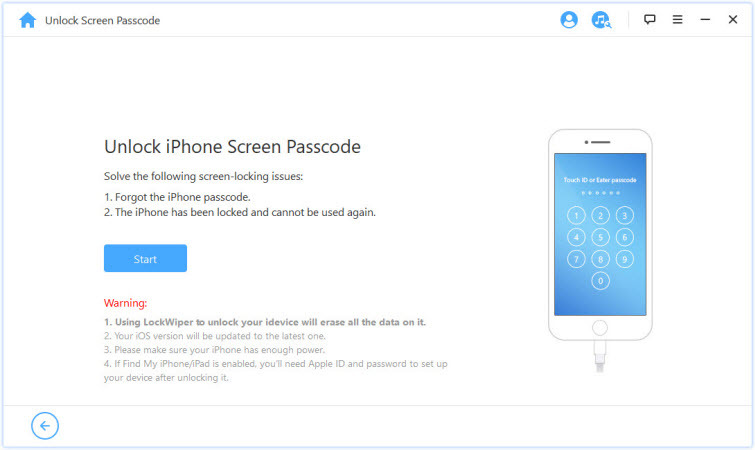 LockWiper unlocks iCloud account on all activated iOS devices without a password. Wins trust from top tech media, like SOFTPEDIA, download.hr, iOS HACKER, etc. Step 1. 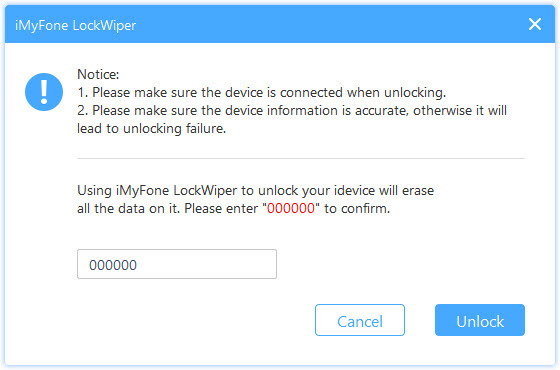 Download, install and launch iMyFone LockWiper on your Windows or Mac PC, and then click “Start”. Step 2. Connect your iPhone to computer. 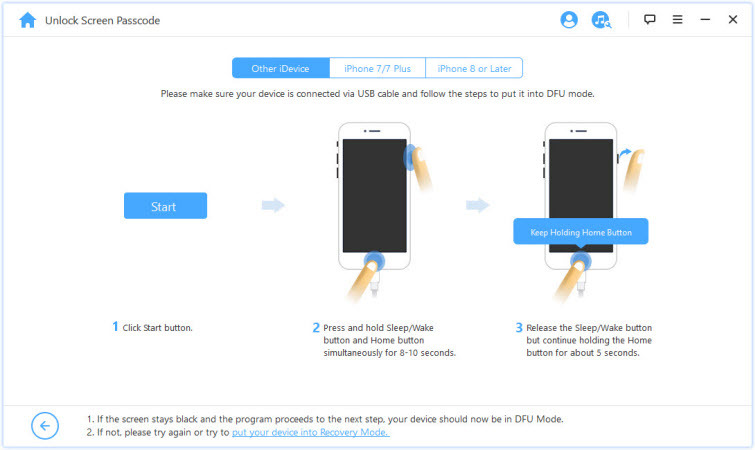 Choose your device model from the top bar and follow the on-screen instruction to put your iPhone in DFU mode. Step 3. Check to know if the unlocking firmware LockWiper is about to download for your device matches your device specification. Then click “Download”. 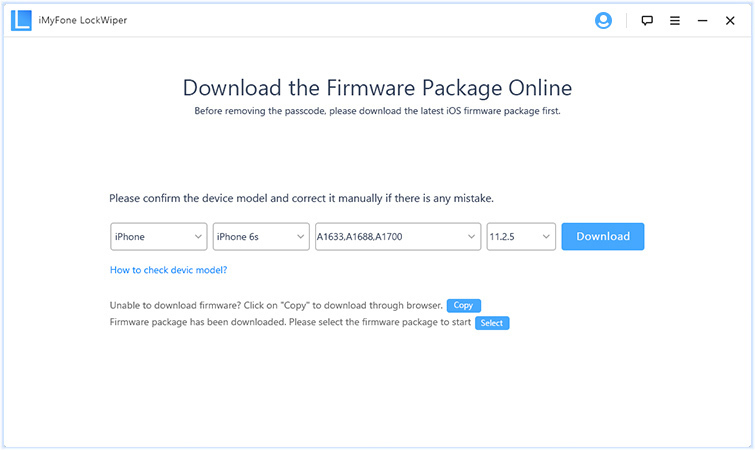 After the firmware package is downloaded, click “Start to Verify”. Step 4. Once the verification is complete, you can click “Start Unlock” to begin unlocking your iPhone. Enter “000000” into the box to confirm that you agree to unlock your device. Then click “Unlock”. Siri is official Apple device voice assistance and it provides answers to your questions and commands either from the contents on your iPhone or from the internet. However, there is a little loop in Siri that can help you bypass your iPhone lock screen if you’re still running iOS 8 - 10.1. Step 1. Press and hold down the iPhone home button to activate Siri. Then ask Siri “What time is it?” Siri will show you the clock icon. Tap on it to open World Clock feature. Step 2. Tap “+” button and then simply enter any words when searching the city. Tap the words to choose “Select All”. Step 3. Choose “Share” and click “Message icon”. It will lead you to edit a new message. Step 4. In the “To” field, tap any words and then tap the “return” button in your keyboard. Your textual content will become green. Step 5. Now tap “+” icon and then “Create new contact”. Step 6. Tap "add photo" and select “Choose Photo”. It will open the photo library on your iPhone. Step 7. Tap the home button after several seconds and it will lead you to your iPhone home screen! This method is only available for iOS iOS 8 – 10.1. Even if your iPhone is in iOS 8 to iOS 10.1, it doesn’t always work. It works depending on luck. The Siri feature should be enabled when your iPhone is locked. It helps bypass the password, but it doesn’t change or reset your password. Every time you want to get into your locked iPhone, you need to follow those steps. Unfortunately, this method only works for those who have enabled Find My iPhone on their device before it was locked. Step 1. Go to https://www.icloud.com/#find and sign in with уоur Aррlе ID and раѕѕwоrd. Stер 2. Cliсk “Find iPhone”. Step 3. Click “All Devices” аt thе tор оf уоur brоwѕеr windоw. Step 4. Sеlесt the iPhоnе that you would like to unlock. After these steps, your iPhone will be erased. Nevertheless, don’t forget that this method is for only those who have enabled Find My iPhone. Your iPhone should also connect to internet. If you haven’t done this, then choosing iMyFone LockWiper will be the best option for you.